Objective To evaluate the effectiveness of quality improvement collaboratives in improving the quality of care. Data sources Relevant studies through Medline, Embase, PsycINFO, CINAHL, and Cochrane databases. Study selection Two reviewers independently extracted data on topics, participants, setting, study design, and outcomes. Data synthesis Of 1104 articles identified, 72 were included in the study. Twelve reports representing nine studies (including two randomised controlled trials) used a controlled design to measure the effects of the quality improvement collaborative intervention on care processes or outcomes of care. Systematic review of these nine studies showed moderate positive results. Seven studies (including one randomised controlled trial) reported an effect on some of the selected outcome measures. Two studies (including one randomised controlled trial) did not show any significant effect. Conclusions The evidence underlying quality improvement collaboratives is positive but limited and the effects cannot be predicted with great certainty. Considering that quality improvement collaboratives seem to play a key part in current strategies focused on accelerating improvement, but may have only modest effects on outcomes at best, further knowledge of the basic components effectiveness, cost effectiveness, and success factors is crucial to determine the value of quality improvement collaboratives. Stimulated by the concerted, ongoing efforts of the Institute of Medicine and other platforms which state that “reform around the margins is inadequate to address system ills” in quality of care, healthcare organisations in many countries are setting up quality improvement collaboratives. Multidisciplinary teams from various healthcare departments or organisations join forces for several months to work in a structured way to improve their provision of care. Quality improvement collaboratives are being used increasingly in the United States, Canada, Australia, and European countries. In northern European countries such as the United Kingdom and the Netherlands health authorities support nationwide quality programmes based on this strategy. Different types of multiorganisational collaboratives exist, the purpose of which are to improve care.1 2 3 The term quality improvement collaborative seems to be used for different multifaceted packages that focus on accelerating better outcomes.4 Quality improvement collaboratives are used in different clinical areas and organisational contexts and have been adopted by numerous large and small healthcare systems and individual clinics. These initiatives represent substantial investments of time, effort, and funding in the delivery of health care, although estimates of the total investment and applications of the collaborative are not available.5 The strength of the quality improvement collaborative seems to be the relatively efficient use of experts and peers and the exchange of best practices to facilitate and guide improvement. The earliest well documented activities of quality improvement collaboratives are those of the Northern New England Cardiovascular Disease Study Group, established in 1986, and the Vermont Oxford Network, established in 1988. Another well known approach is the Breakthrough Series developed by the Institute of Healthcare Improvement in 1995. Many of the present approaches of the quality improvement collaborative are based on those of the Breakthrough Series. A recent non-systematic review6 concluded that the collaborative methodology has important potential to improve outcomes for patients and to facilitate sustainability of quality improvement. Unfortunately this introduction to the collaborative methodology neither considers whether the evaluation of effectiveness is based on a controlled or an uncontrolled study design nor makes clear on what types of quality improvement collaborative the conclusions are based. Clear evidence of the effectiveness of the methods is lacking, despite the ongoing initiatives of the quality improvement collaborative reflecting different multifaceted intervention packages, the growing number of published papers, good face validity of the model, and facilitators claiming that many professionals appreciate taking part in a collaborative for both professional and organisational development.4 Little is known about the effectiveness of quality improvement collaboratives or specific components that enhance the effectiveness of such collaboratives, and there is hardly any information about their cost effectiveness and sustainability. We therefore assessed the effectiveness of the quality improvement collaborative by systematically reviewing empirical studies. We searched Medline, CINAHL, Embase, PsycINFO, and Cochrane databases for literature on quality improvement collaboratives in the period from January 1995 to June 2006 inclusive. Initially we searched Medline using free text terms describing quality improvement collaboratives, and we combined these with the keywords (non-MeSH) “quality and improvement and collaborative” or “(series or project) and breakthrough” (box 1). These steps were repeated for the other databases. We also reviewed the reference lists of the included papers. We included studies that were written in English, contained data on the effectiveness of care processes or outcomes, were in a healthcare setting, and met the criteria for a quality improvement collaborative derived from a rigorous analysis of the theoretical literature on quality improvement collaboratives (box 2).1 4 7 8 9 To include studies we used the following definition and criteria. A quality improvement collaborative is an organised, multifaceted approach to quality improvement that involves five essential features: there is a specified topic—a subject exists with large variations in care or gaps between best and current practice; clinical experts and experts in quality improvement provide ideas and support for improvement—they identify, consolidate, clarify, and share scientific knowledge and best practice as well as knowledge in quality improvement; a critical mass of multiprofessional teams from multiple sites is willing to improve and share care; a model for improvement focuses on setting clear and measurable targets, collecting data, and testing changes on a small scale to advance reinvention and learning by doing; and the collaborative process involves a series of structured activities (meetings, an active email list, visits to facilitators) in a given time frame to advance improvement, exchange ideas, and share experiences of the participating teams. Each potentially eligible study was independently assessed by two reviewers (LMTS and MEJLH) for inclusion and quality. We assessed the methodological quality of the studies by evaluating the design, method of randomisation, characteristics of control sites, protection against bias, reliable outcome measures, and how sites and patients lost to follow-up had been handled in the analysis (see checklist of the Cochrane Effective Practice and Organisation of Care Review Group at www.epoc.cochrane.org). We used a standardised extraction checklist to obtain data on topics, study design, setting, numbers of participants, characteristics of the collaborative strategy, and relevant results. Two of the authors (LMTS and MEJLH) independently completed this checklist for each study. Disagreements on data extraction and classification of study results were resolved by consensus. We categorised the studies in groups on the basis of their study designs and characteristics of the collaborative strategy used. We could not use formal meta-analytical techniques for pooling results because the studies used many different effect measures. Figure 1⇓ shows the flow of papers through the review. Overall, 1104 abstracts of studies published from January 1995 to June 2006 were identified. During screening 929 papers were excluded on the basis of the abstract because they did not fulfil the inclusion criteria or because of duplication. A total of 175 articles were requested for detailed review. An additional 107 articles were subsequently excluded; 49 studies contained no original data on effectiveness or outcomes and 58 did not meet our criteria for a quality improvement collaborative. The criteria most often not fulfilled were the lack of structured activities aimed at exchange of ideas and information between participating teams (collaborative process) and the fact that participants did not set aims, collect data, and test changes in quick succession (model for improvement). Reviewing the reference lists of the remaining 68 studies led to the identification of a further 18 potentially eligible studies. Four of them fulfilled our inclusion criteria and did not duplicate any of the studies already included. A total of 72 papers were eligible for inclusion in the study. Of the 72 papers included in our study, 60 (83%) reportsw1-w60 used an uncontrolled study design. Fifty (83%) of these 60 reports were based on the Breakthrough Series. Several studies contained elements that went beyond a simple quality improvement collaborative. The quality improvement collaboratives in these reports were embedded in ongoing quality initiatives or used comprehensive systems for measuring performance. Of the 60 reports of uncontrolled studies 37 (almost 62%) were based on self report measures of the participating teams or sites and 14 (23%) of the studies were single case reports describing changes in an individual facility or team (a detailed table listing the uncontrolled studies is available from the authors). The study designs of the uncontrolled reports relied almost entirely on post measurement, used before and after studies without being able to account for secular trends, made use of self report measures rather than reviews of medical records, included only anecdotal information, or selected samples from self selected sites. Conclusions on effectiveness could not be drawn from these reports owing to the lack of adequate reporting procedures on data collection, analysis, and objective evaluations. Eleven reports (eight studies)w61-w71 used a “comparison group” study design. One studyw72 used an interrupted time series design (table 1⇓). Most studies were published in 2004 and 2005. The characteristics of the collaborative strategy used in these nine studies varied. Seven studiesw61- w68 w72 were explicitly based on the Breakthrough Series. Four of these combined the Breakthrough Series with elements of the chronic care model (www.improvingchroniccare.org).w62 w64-w68 Two studiesw69-w71 were based on the Vermont Oxford Network. Box 3 gives an overview of the different collaborative strategies. Table 1⇓ shows the methodological quality of the nine studies. Most studies had important flaws. Limitations included possible differences in baseline measurement, limited data on characteristics of control sites, no specification of blinded assessment, and possible contamination. A Breakthrough Series is a short term (6 to 15 months) learning system that brings together a large number of teams from hospitals or clinics to seek improvement in a focused topic area. The driving vision behind the Breakthrough Series is that sound science exists on the basis of which the costs and outcomes of current healthcare practices can be greatly improved, but much of this science is unused in daily work. The Breakthrough Series is designed to help organisations make “breakthrough” improvements to close this gap by creating a structure in which interested organisations can easily learn from each other and from recognised experts in topics where they want to make improvements. The Vermont Oxford Network is a data driven, “non-profit, voluntary collaboration of health care professionals dedicated to improving the quality and safety of medical care for newborn infants and their families.” It was established in 1988, and today the network includes more than 400 neonatal intensive care units, predominantly in the United States. The network facilitates a coordinated programme of research, education, and quality improvement. To support this programme, the network maintains a database of infants with very low birth weight at the member hospitals. The database includes information concerning medical practices and patient outcomes such as morbidity, mortality, and length of stay. Members of the network receive centre specific, routinely prepared, confidential reports. Two of the nine studies were randomised controlled trials, one of which was a trial of a quality improvement collaborative for children with asthma and based on a combination of the Breakthrough Series and the chronic care model.w64 The other was a large trial of a quality improvement collaborative for neonatal intensive care and based on the Vermont Oxford Network method.w71 The trial based on the Breakthrough Series and chronic care modelw64 did not show effects on any of the key processes or intermediate outcomes of care for children with asthma. The trial based on the Vermont Oxford Network methodw71 showed significant improvement in two specific processes of care but no significant improvement in patient outcomes (mortality and pneumothorax), nor in 20 of the 23 secondary process measures. In this cluster randomised controlled trial, infants in the intervention hospitals (n=57) were more likely to receive a surfactant in the delivery room (54.7% v 18.2%) and were less likely to receive the first dose more than two hours after birth (9.4% v 24.9%) than infants in the control hospitals (table 2⇓). Five of the six controlled before and after studies based on the Breakthrough Seriesw61 w62 w65-w68 w72 showed significant improvements in the outcomes of care. Pierce-Bulger et alw72 showed a significant improvement in the number of days between neonatal deaths—increase from an average of 55 days (1989-94) before the programme to an average of 114 days (1995-2000)—during a seven year quality programme including a Breakthrough Series project in 1993. In Baier et al’s study,w61 the prevalence of residents with pain in 21 nursing homes diminished significantly (7.2% v 11.2% of patients) after participation in a Breakthrough Series. Landon et al’s studyw63 of 9986 patients with HIV infection did not show any significant effect on virological outcomes or process measures, such as screening, prophylaxis, and access to care. The controlled before and after study based on the Vermont Oxford Networkw69 w70 reported a significant decrease in the rate of infection at six intervention neonatal intensive care units (12.3% v 16.5%) and a decrease in the rate of supplemental oxygen at four neonatal intensive care units (34% v 38.7%). Although the effect among the units on both arms was heterogeneous, the changes show that the intervention units improved at a significantly faster rate in a four year period than did the 66 comparison units. In the same study, Rogowski et alw70 presented data showing that costs may be reduced as a result of participation in the quality improvement collaborative, although the cost savings across hospitals were heterogeneous. Table 3⇓ gives a summary of effectiveness found in the nine controlled studies. Worldwide, organisations are adopting the approach of the quality improvement collaborative in different settings. The evidence underlying the strategy is positive but limited and the effects cannot be predicted with certainty. Twelve reports representing nine studies (including two recent randomised controlled trials) used a controlled design to measure the effects of the quality improvement collaboratives intervention on processes of care or outcomes of care. The studies were based on different collaborative strategies. Seven studies evaluated the Breakthrough Series, four of these were studies on the Breakthrough Series combined with chronic care model and two were based on the Vermont Oxford Network method. A systematic review of the studies produced moderate positive results. Seven studies (including one randomised controlled trial) showed at least a positive effect of a specific selection of processes of care studied. Two studies (including one randomised controlled trial) did not show any significant effect. As a result of flaws in the methodological quality of the studies and the heterogeneity of the intervention itself, there is no certainty that the quality improvement collaborative was responsible for an effect. Six studies reported possible differences in baseline measurement. One of the controlled studies was a Breakthrough Series embedded in a seven year quality improvement programme. Four of the studies contained elements of the chronic care model in the intervention. Two of the controlled studies were based on the Vermont Oxford Network. This type of quality improvement collaborative differs from the Breakthrough Series in that it is long term: efforts are led and supported by ongoing data collection of individual member organisations and an ongoing infrastructure of communication and meetings exists that goes beyond a particular limited time frame of a quality improvement collaborative initiative. We were unable to disentangle the different components of an intervention or to assess interactions between longitudinal activities for quality improvement or elements of the chronic care model and collaborative components. Fifty three (88%) of the 60 uncontrolled reports highlighted specific improvements in patient care and organisational performance that resulted from participating in a quality improvement collaborative. Several reports showed dramatic improvements of 30% to 80%. Almost all of the uncontrolled reports, however, had design limitations, were methodologically weak, and were probably biased in favour of positive findings in successful teams. Limitations should be considered in interpreting the results of this review. Firstly, as in any systematic review we may have missed relevant studies. We searched multiple databases, however, and checked our search with free text words with a strategy that included MeSH terms (box 1) based on key words in the relevant studies. These searches did not add new studies. Secondly, our search was limited to quality improvement collaboratives involving the five essential features described in our inclusion criteria and to English language journals. This might have introduced bias if the effectiveness described in these studies differed systematically from those involving other features and appearing in other languages. 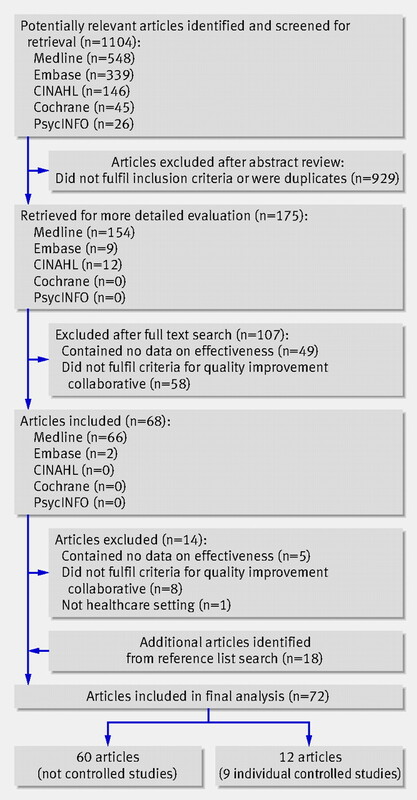 Thirdly, the key components of some quality improvement collaboratives could have been misclassified, although our abstraction process showed good inter-rater reliability. Despite these limitations, this review shows that the evidence underlying quality improvement collaboratives is positive but still limited and that the effects cannot be predicted with great certainty. The Centre for Quality of Care Research, University Medical Centre St Radboud, Nijmegen is now called IQ healthcare, Radboud University Nijmegen Medical Centre. Contributors: LMTS and MEJLH analysed the data. JJEvE, RH, and RPTMG interpreted the data. All authors conceived and designed the study, drafted and revised the manuscript, and approved the final version. LMTS is guarantor. Competing interests: LMTS and JJEvE work at the Dutch Institute for Quality Improvement. The views and opinions expressed are those of the authors and do not necessarily reflect those of the institute. Plsek PE. Collaborating across organizational boundaries to improve the quality of care. Am J Infect Control1997;25:85-95. Solberg LI. If you’ve seen one quality improvement collaborative . . . Ann Fam Med2005;3:198-9. Ayers LR, Beyea SC, Godfrey MM, Harper DC, Nelson EC, Batalden PB. Quality improvement learning collaboratives. Qual Manag Health Care2005;14:234-47. Øvretveit J, Bate P, Cleary P, Cretin S, Gustafson D, McInnes K et al. Quality collaboratives: lessons from research. Qual Saf Health Care2002;11:345-51. Mittman BS. Improving patient care. Creating the evidence base for quality improvement collaboratives. Ann Intern Med2004;140:897-901. Newton PJ, Davidson PM, Halcomb EJ, Denniss AR, Westgarth F. An introduction to the collaborative methodology and its potential use for the management of heart failure. J Cardiovasc Nurs2006;21:161-8. Kilo CM. A framework for collaborative improvement: lessons from the Institute for Healthcare Improvement’s Breakthrough Series. Qual Manag Health Care1998;6:1-13. Kilo CM. Improving care through collaboration. Pediatrics1999;103(1 suppl E):384-93. Wilson T, Berwick DM, Cleary PD. What do collaborative improvement projects do? Experience from seven countries. Jt Comm J Qual Saf2003;29:85-93. Black N. Why we need observational studies to evaluate the effectiveness of health care. BMJ1996;312:1215-8. McKee M, Britton A, Black N, McPherson K, Sanderson C, Bain C. Methods in health services research: interpreting the evidence: choosing between randomised and non-randomised studies. BMJ1999;319:312-5. Kirkwood B. Making public interventions more evidence based. BMJ2004;328:966-7. Marsteller JA, Shortell SM, Lin M, Mendel P, Dell E, Wang S, et al. How do teams in quality improvement collaboratives interact? Jt Comm J Qual Patient Saf2007;33:267-76. Shortell SM, Marsteller JA, Lin M, Pearson ML, Wu SY, Mendel P, et al. The role of perceived team effectiveness in improving chronic illness care. Med Care2004;42:1040-8. Schouten LMT, Hulscher MEJL, Akkermans R, van Everdingen JJE, Grol RPTM, Huijsman R. Factors that influence the stroke care team’s effectiveness in reducing the length of hospital stay. Stroke (in press).